Across time, across language, alphabets dance and merge in Golden Smoke, teasing the eye and making new meaning. Kitty Jospé's poems write back against pain and loss. They offer solace, invite intimacy. They cry out and laugh. And like her father's goodnight blessing, the poems comfort us with the promise that "all's good." Kitty Jospé's poems powerfully engage the world in their range and depth of observation. The reader has the additional pleasure of wandering through museums with an eloquent docent and insightful poet at our side. If some poems embrace commitment to family and community, others meditate on heart-wrenching loneliness and loss. As she writes, "Hang on/we need to/hang on/tight." She does. It may be that Kitty Jospé's commitments to "the paradox of power" - of sound, of sorrow, of natural ecstasies and shared associations, complicate and strengthen these deceptively delicate, intimate poems. Prepare to be moved. Playfully, purposefully, Jospé travels far from home and back again, taking us with her to "Prayer in Istanbul" ("not yet settled") and returning by way of a troubling villanelle: "To which life, will you toughen, / what memory blacken, word by word?/ Don't." But it's the light that takes us in at last: "Love opens." I have always been intrigued by the power of paradox to sharpen our awareness and bring us to imagine the unimaginable. The title of this collection of poems is inspired by the plant Golden Smoke (Corydalis aurea). Its yellow blossoms also give it the epithet of Scrambled Eggs. Known for its medicinal qualities when brewed in tea for various aches and pains, it is also poisonous if ingested. The long-lived seeds may lie dormant until stimulated by such disturbance as fire. "Wordless charcoal" combines a fire's destruction with creation of charcoal as medium to trace and transcribe memory of experience. "Half-cadences", also known as "incomplete" or "cadences imparfaites", fool us into thinking the music we hear has reached an end. The poems in the section "Scrambled" and "Color for burnt land" celebrate the power of emotion, art and imagination. 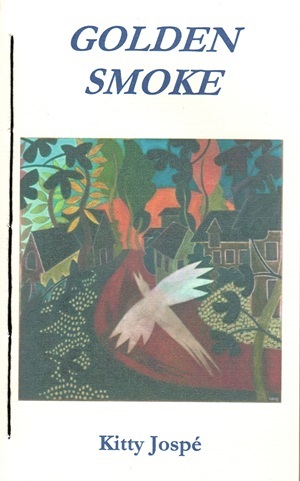 The Place I've Never Seen, title of the artwork on the cover of Golden Smoke, is by Lynne Feldman. When I saw this piece, I fell in love with the layering and textures, and sense of aliveness in the dancing organic forms and the sense of mystery in the houses of the village. Each section's title in my book feels reflected in the vibrant embrace of this collage. Anything can happen, and yet, whatever does, is under the watch of the dove and its shadow. About the artist who created the cover art. hope of color for the burnt land. We watch after the fire. wordless charcoal in the sky. 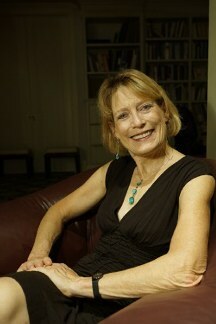 Kitty Jospé holds an MA in French Literature from New York University (1984) and an MFA in creative writing, Poetry, from Pacific University, Oregon (2009). Her passion for teaching and enthusiasm for the arts is nourished by her work as a docent at the Memorial Art Gallery and also by performance. She finds great joy in inspiring others through the music and crafting of words. Golden Smoke is her 4th book preceded by Cadences (FootHills, 2009); Mosaicq (semi-finalist for Finishing Line Press 2012) and sequel Gathering Lines.